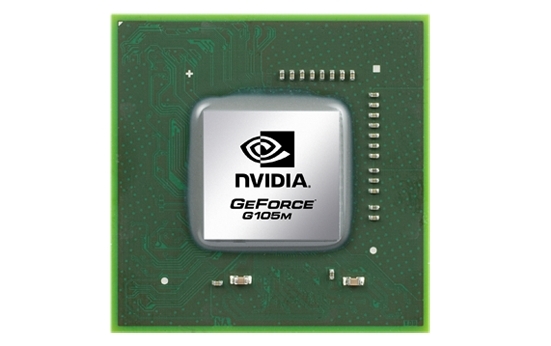 The Nvidia GeForce G 102M is an integrated (onboard) graphics card for laptops with dedicated graphics memory. Instead of GDDR memory, cheap DDR2 or DDR3 main memory modules can be used. Therefore, the performance lies beyond the Geforce G 105M. The core of the G102 M is based on the 9400M G core. The performance of the G 102M should be slightly above the old 9400M G and compareable to other entry level GPUs like the GeForce 9300M GS. Therefore, the graphics adapater is able to display older games (like Doom3) in high details fluently and new (not too demanding games) in low details fluently. The current consumption of the mGPU should be a bit higher than the 9400M because of the used descrete DDR2 or DDR3 memory (9400M has a 12 Watt TDP for the whole chipset. The chipset supports Hybrid-SLI (HybridPower) in conjunction with some GeForce 9x00M cards like the 9600M GT. HybridPower is a technique to choose between the integrated and dedicated graphics core, if performance or battery runtime is needed. Up to now the user has to use a tool to switch between the GPUs. (in Windows Vista, XP is not supported and MacOs needs a reboot according to Nvidia - at time of announcement). GeForceBoost to boost the performance (using SLI) is not supported in the MacBook Pro. As the 9500M G, the Geforce G102M features 16 stream processors that do the work of the former dedicated pixel- and vertex-shaders. The unified shaders of Nvidia are 1-dimensional (AMD has 5-dimensional shaders which leads to the higher number of shaders). The 102M can help the CPU in decoding HD videos. It features the PureVideo HD engine (VP3 video processor). Furthermore, the chip can be programmed using CUDA and can accellerate some operations in Photoshop CS4.